Imagine starting your summer vacation with what you thought was a trip to your mom’s doctor’s appointment. On the way, you stop at Meijer in Mt. Pleasant to get a cold drink, but you end up leaving the store with much more than a refreshment. Keaton Mater, 12, of Roscommon, experienced this scenario when he found out he won a new bike from Barberi Law’s Bikes for Kids program. Mater’s parents, Roger and Cheryl, wanted to surprise him, so they didn’t tell him ahead of time that he was selected. A huge smile spread across Mater’s face when he was told he could pick any bike he wanted. He explained how he felt after learning the news. Cheryl found out about the Bikes for Kids program on the 9&10 News website. She was “ecstatic” when she got the call that her nomination helped Mater win the bike, plus a helmet and lock donated by Meijer. Cheryl echoed her statements at Meijer when Mater found out why he was chosen to win the bike. He talked about how his mom’s words made him feel. Mater, who will be in seventh grade this fall, explained how he talks to others about autism. He also talked about how he handles those who bully him. Mater is looking forward to spending the summer riding his new bike with his dad at Kirtland Community College, which is near their house. He also loves to play basketball with his dad, and play in the water with his dog, Sadie. For Mason Eisenberger, 9, being kind isn’t really something he has to think about. His Shepherd Elementary teacher, Annette Sponseller, thought his attitude and behavior deserved recognition. Sponseller nominated Eisenberger to win a bike through Barberi Law’s Bikes for Kids program. 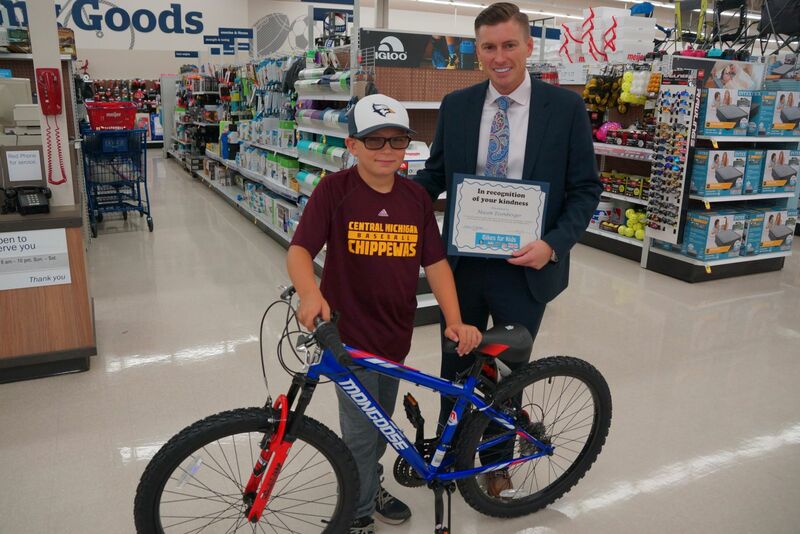 Eisenberger was really excited and happy to find out his teacher nominated him to win the bike, helmet and lock at Meijer in Mt. Pleasant. He talked about why he thought it was important to help others. Eisenberger is looking forward to riding his new bike, when he isn’t playing baseball. He is on two teams in Shepherd. One is a traveling team, the Salt River Bandits, and he plays catcher and second base. He also enjoys hunting, fishing, football, basketball and soccer. Eisenberger’s mom, Jenna, his sister, and grandparents came to help him pick out his bike. They were moved by his teacher’s kind words. Nyilee Smith, 10, of Williamsburg, couldn’t stop smiling on her first trip to Mt. Pleasant. She didn’t mind the long drive, since her destination was Meijer to pick out the new bike she won as part of Barberi Law’s Bikes for Kids program. Smith had no idea she was nominated by her mom, Candace Jaruzel, to win the bike, helmet and lock. Smith was excited about the surprise and said her mom’s nomination made her feel good. Smith said thinking of and helping others just comes naturally to her. Volunteering for Meals on Wheels made Smith feel good about herself, too. When she gets her driver’s license, she plans to deliver the meals all by herself. She will be a fifth grader at Cherry Knoll Elementary in Traverse City. She loves learning about history, and also loves sports. She has run track and has played volleyball, soccer and tennis. Her family lives near the bike trails in Traverse City, so they also enjoy going on bike rides. Jaruzel shared how she felt when she found out her daughter was chosen as a Bikes for Kids winner. It’s not every day that you see a girl riding a bike around inside Meijer. That’s exactly what Trinity Lachance, 8, of Roscommon, did after she picked out the new bike she won through Barberi Law’s Bikes for Kids program. Maureen Verbruggen, Lachance’s grandma, nominated her to win the bike, helmet and lock. Lachance was pretty happy when she found out her grandma nominated her to win a bike. Her mom, Kathy Verbruggen, told her the good news. After another girl bullied her, Lachance decided to raise money for the Buddy Bench. She and her mom spent a lot of time collecting and returning cans and bottles to gather the $600 they needed. The bench is a way to make everyone feel included and make new friends. Lachance shared why she thinks it is important to help others. She attends Grayling Elementary School’s Extended Learning Year program, which adds 10 additional learning days to the traditional school year. She finished school the last week of June, and she starts fourth grade in mid-August. She likes recess, math and reading the most. In her free time, she plays on her tablet, jump ropes, swims and rides her bike. Lachance is deciding what project she wants to raise money for next. She thinks it might be something to do with animal shelters. Her mom is proud of all of her efforts. “I was happy because she’s getting recognized for the good things she has done,” Kathy said. The day wasn’t going well for Anna Mozurkewich, 12, of Mt. Pleasant, but some surprising news from her mom definitely turned her mood around. 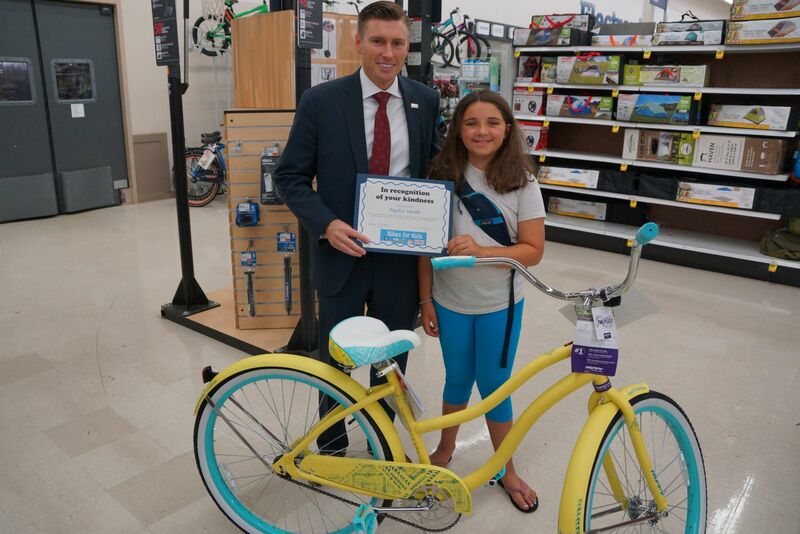 Her mom, Nicole, told Mozurkewich she was chosen to win a bike through Barberi Law’s Bikes for Kids program. Nicole nominated Mozurkewich for her kindness and willingness to help others. Mozurkewich talked about how hearing what the nomination said made her feel. If you help other people, Mozurkewich said, they will always know there is someone there for them. When it comes to offering advice on why she thinks it’s important to help others, Mozurkewich is very clear on what she believes is the biggest benefit. “When you help people, it not only helps them, it makes you feel good about yourself,” she said. Along with the bike from Barberi Law, Mozurkewich also won a helmet and lock donated by Meijer. Nicole talked about how she felt after learning her daughter won. Language Arts is Mozurkewich’s favorite subject at Mt. Pleasant Middle School, where she will be in eighth grade, and she loves to read. Besides reading, she likes to ice skate, watch TV, swim with her grandma, camp and fish. A totally unexpected surprise for Aliyah Screws, 8, of Shepherd, led to some careful planning leading up to the big day. Screws had no idea her teacher nominated her to win a new bike through Barberi Law’s Bikes for Kids program. When she found out she won, though, she started getting ready. The first thing she did after finding out was go to her room and get a letter her teacher had written her during the school year. She was going to use the return address to write her teacher a thank you note. Screws was so happy to hear why she was nominated. Leading up to the day she got to pick out her new bike, Aliyah planned her outfit for the occasion. She didn’t want to wear a dress because that would be hard to test a bike out in, so she chose some plaid shorts and a pink, orange and white shirt to match. She also wore some light makeup and painted her nails for the big day. Screws said it makes her happy to help other people and she enjoys the good feelings that come from putting others first. “If you’re just helping yourself, the world might not be a better place,” she said. “If you do something good for them, they might pass it on. She enjoys helping in the nursery at church, as well. Tammy, Aliyah’s mom, said she wasn’t surprised by Dickman’s kind words about her daughter because Dickman had shared her feelings about Screws in the past. Screws wrote a poem about Dickman, and she had called Tammy to tell her how much the poem meant to her. However, Tammy was surprised about the nomination and that Screws won a bike, along with a helmet and lock donated by Meijer. “I was so grateful our middle child was being blessed,” Tammy said. Screws will be in fourth grade at Shepherd Elementary. She loves to read, draw and play Barbies with her mom. Even though he told his grandma not to do it, Dakota Perkins, 14, wasn’t surprised she went ahead and nominated him to win a bike through Barberi Law’s Bikes for Kids program. However, he didn’t really believe her when she woke him up one morning and told him he won. His grandma, Donna Paull, felt Perkins deserved some recognition for all of the selfless things he does. She said he never will take money for anything he helps with, so she tries to pay him back in other ways. A simple thank you is more motivation than anything, Perkins said, about why he thinks you should help other people. He doesn’t expect any more than that, and enjoys the warm feeling he gets inside, knowing that he helped someone. Perkins said it’s important to let others know that someone else is there for them, since a lot of people feel like they’re alone and have no one to support them. Paull brought Perkins to Meijer in Mt. Pleasant, a two-and-a-half-hour drive from his home in Hawks, Michigan, to pick out his bike, helmet and lock. She said she never minds doing whatever she can to support her grandson. Perkins will be in ninth grade at Rogers City Area Schools. He enjoys building birdhouses, riding four-wheelers, going in the woods with his grandpa and working on cars. His favorite subjects in school are social studies and science. Switching to a smaller school has brought positive things to Skyler Wilson, 16, of Kewadin, including winning a new bike through Barberi Law’s Bikes for Kids program. Wilson was surprised she was nominated by one of her teachers at Sunrise Academy in Elk Rapids. “I didn’t sign up for anything, so I didn’t know why I won,” Wilson said. Kathy Moody-Breece, one of Wilson’s teachers, mentioned many reasons why she felt Wilson was deserving of the bike, helmet and lock. After she heard what was written in her nomination, Wilson got choked up and said she was about to cry. She said the satisfaction she gets is her biggest motivation for helping others. There is enough bad in the world, she said, that she wants to make sure she is helping do something good. Her mom, Jessica, feels Wilson has benefited greatly from going to a smaller school, instead of getting lost in the shuffle at a bigger school. When she isn’t working at the Cone Corral & Pizzeria in Elk Rapids, Wilson enjoys art. She loves to draw, sketch and do spray paint art. She also loves spending time with her nephew, Ricky, who is 2 years old. She will be in 11th grade at Sunrise Academy in the fall, where she participates in softball and cheerleading. Helping her community and family is something Emily Heffner, 14, of Gaylord, does naturally. Her grandma wanted to recognize all of Heffner’s hard work, so she nominated her to win a bike through Barberi Law’s Bikes for Kids program. Mary Evans, Heffner’s grandma, said Heffner was out mowing her lawn when she decided to nominate her for the bike. Heffner said it’s nice to know her grandparents appreciate what she does for them. “I already know that, but it’s nice that she put it in writing,” Heffner said, after hearing what Evans wrote. Volunteering for Toys for Tots is Heffner’s favorite thing. She said she is always lucky at Christmastime, so she wants to pass that feeling on to other kids. “You can picture the kids’ faces when they get their presents,” Heffner said. According to Heffner, helping others is important because you never know when you might need some help yourself. “It just comes back around to treat others how you would want to be treated,” she said. Even though it’s nice to be recognized for her work, Heffner has another reason for helping others. “It’s always a good feeling because you know someone’s going to get a smile out of it,” she said. Her mom, Marci, was surprised and excited Heffner was given a new bike. Heffner will be in ninth grade at Gaylord High School. She loves playing sports, especially softball, camping and being outdoors. English is her favorite subject because she likes writing, and she likes gym a lot. Winning something for the first time filled Kolby George, 13, of Cadillac, with a mix of nervousness and excitement. He couldn’t disguise his happiness when he found out he was chosen to win a bike through Barberi Law’s Bikes for Kids program. His mom, Lora Duncan, nominated George for the honor, which also included a helmet and lock donated by Meijer in Mt. Pleasant. Duncan’s boss, Deborah Delosa, also wrote a nomination for George. She talked about how the residents love George and said he makes a difference in their days. George had no idea what his mom and Delosa wrote about him. “It makes me feel really good,” he said, after hearing their words. The residents at Samaritas are George’s favorite part of helping out there. “I like to play games with them, especially checkers,” he said. He also enjoys seeing the smiles on the residents’ faces when he visits the facility, and explained why he thinks it’s important to help others. For the past two weeks, George has volunteered at Samaritas from 5:30 a.m. to 3 p.m. every day. He helped take care of residents and with activities. He helps whenever he can during the summer, and when he is going to school, he helps on the weekends mostly. Duncan shared her feelings about finding out George was picked to win the bike. George will be an eighth grader at Cadillac Junior High. He enjoys watching TV, playing games, walking his dog and sports. He likes math, even though he says he’s not the best at it, but he really likes his teacher. He also likes gym, language arts and science.